Message From Odette Constant - Founder Odette Constant was born in Port-au Prince Haiti where she attended school from kindergarten until the 10th grade. 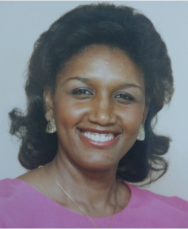 Although she relocated to Brooklyn, New York, like most Haitians, she maintained a passion for her homeland of Haiti; including the culture, the music, the art, and the wonderful food. Her personal connection was undeniable and her desire to help people lent a hand in molding her career. Eventually Odette became a Registered Nurse, a graduate from Long Island University in Brooklyn, New York with a Bachelor's degree in Nursing Education. She also attended C.W. Post on Long Island, New York for graduate school. With over 30 years of experience in the health care industry she has held leadership positions in many different institutions. Among her many business involvement, she is the owner and CEO of La Madone Registry Inc. in Orlando, Florida. Prior to founding La Madone Registry in 2000, she worked in several hospitals as a critical care nurse and manager, including North Shore University Hospital in Long Island, New York where she spent 15 years. She has also worked at South Seminole Hospital ICU in Longwood, Florida for 8 years. She has extensive training in leadership, and has developed and implemented classes for continuing education for Nurses and Nurses' Assistants. She is a member of the Haitian American Nurses Association in Florida and a member of Rollins College Philantrophy, Edyth Bush, the Association of Fund Raising Professionals (AFP), and The Florida Non-profit Alliance. Odette has been very instrumental in getting involved in the Haitian American community, volunteering her services by participating in numerous conferences in the community. This has created a sense of camaraderie and trust. After the devastating earthquake on January 12, 2010, the desire to help save any community became more than just a goal, it became an intense reality. Several nurses, (including Odette) and physicians joined forces to establish an organization dedicated to the wellbeing of the people through instruction, health promotion, nutrition education and community hygiene development. Watching the health care deteriorate by the second for the people of Haiti and seeing the tremendous loss of life, Odette wants to make a difference. And she wants that difference to happen NOW! As a registered nurse, the impact seems even more profound, especially when you can see how some of it could be prevented. She feels committed to responding to the needs of the people, especially the poor and less privileged. That need, will now be met by Haiti Health & Rehab Center. Her long term goal is to build a medical clinic in Haiti, providing nursing care, physical therapy, nutrition and education. With your support, her goal can become a better reality for Haiti! If you have something to spare, donate it to Haiti Health & Rehabilitation. 2018 Medical Mission: Please Join Us!